you know when you have too much stuff going on in your life and a baby is about to fall out of your body if you don't sit down? no? ok, well this is how i feel. my sis in law is getting married this coming week and i am helping with the decor and flowers and ins and outs. so this week and actually this month have been crazy for me. with getting rooms ready, reorganizing spaces, wedding stuff, easter, and blaadeeblaa...just life. this is life. but i mean, how rude of michelle to get married when i'm about to have a baby. ok, fine. she got engaged before i got pregnant. so my fault on the timing. no, nato's fault. i'll blame it on nato. anyshway, we had her lingerie shower last night. i should be cleaning up the mess, but i'm not. no, i'm just posting pics on the intranet. watching hgtv. kids are at a basketball game. quietness. 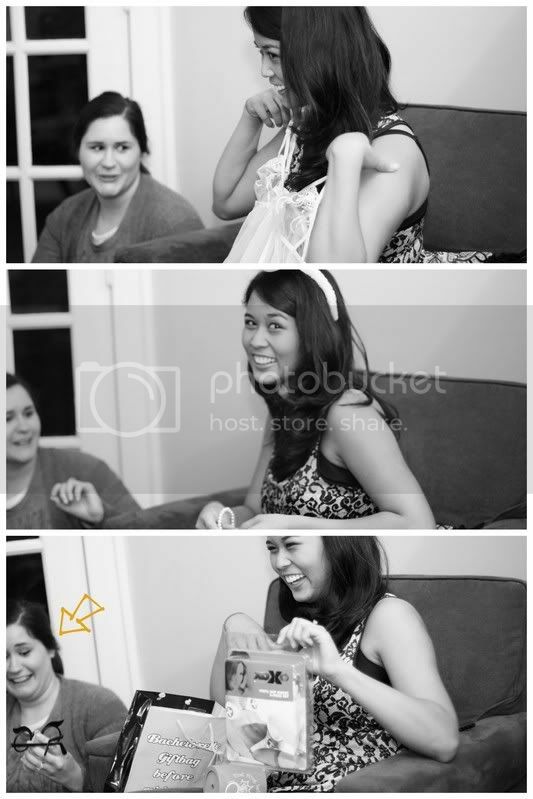 michelle(nato's sis) was embarrassed from opening gifts in front of her mother. and aunts. and mother in law. and my mom. ya, that's funny. please enjoy my sister's face in the background. in her defense, she's looking at something rather disgusting that i can't describe on this blog. anyway, my mom made these cookies. i sent her a picture from the interweb and said, can you make these? oh and can you make the cookies brown? it won't be right if the buns are white. so she made them gingerbread to portray the asian-ness. my mom is cookie maker extraordinair. so of course she busted these out(no pun intended) and they were fabulous. then i made the cupcakes, but had a last minute emergency with the icing. my mom was like, no problem, where are your cupcake stencils? um,what? mom, not everyone has every kitchen gadget in the world. that made me laugh. so audrey cut out a little heart out of paper and we put powder sugar over the top of our homemade stencil. she is brilliant. cupcakes saved! and rice krsipie treats become classy when you roll them into balls and stick a popsicle stick in them, right? maybe not, i don't know. but they were cute. all of this was from michael's dollar section! 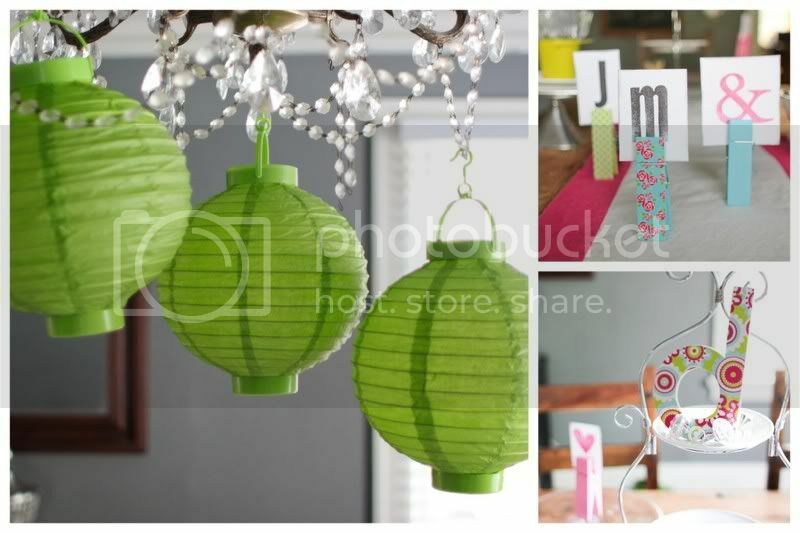 lanterns, oversized clips,and colorful monogram letters. omg, run to michaels and buy everything in this section asap. and here is one of my favorite party tricks. if you have a lot of wine glasses, make people write their name on them with a dry erase marker. it works on the pitchers too(glass or plastic). there are classier ways to label drinks, but this was fast and super easy. and yes, we had a lingerie shower on GOOD FRIDAY. sinners. but again, poor planning a couple months ago on my part. planning is not my spiritual gift, mkay. A freaking mazing. As ALWAYS. hey I'm sure this is idiot's knowledge, but the dry erase just comes off like that?? From glass.? Novice mom and person talking here. very fun! your sis in law is beautiful;) Love the brownish cookies with cute little design by your mom. Love the decor, too. The cookies are soooo cute I just may have to steal that idea at some point. I totally get how you feel (well except for the baby about to fall out of you part, still waiting on God for that) my brother is getting married in May and I was just in showers up to my eyeballs a couple of weeks ago. Then I'm doing all their flowers and a lot of the decorating for the actual wedding....what busy girls we are! Have a happy Easter!! 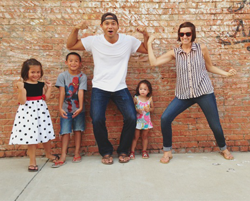 So planning isn't your spiritual gift nor is traveling. Two strikes buddy, one more and I might make you rip up your friend card. JK. I know it's laminated. I want to be your sister in law to get parties like this, ughhhh! yep, it wipes right off glass or plastic! oh my goodness, every detail of the shower was too cute! your mom is a cookie-making genius! and where did you get that pretty turquoise pitcher? glad you had fun! love the cookies (especially appreciate the brown booties). Where are those red bird plates from? I know it has to be somewhere I can afford. I never got an lingerie shower b/c I eloped. I know. My fault, but I still think I should get one... 8 years later. Please don't have a lingerie shower for me. Mmkay? It makes me incredibly nervous. um... you're like AMAZING at party decorating. i love all the details. i am taking down notes. and pretty sure if someone made cookies for me it was be a sad mix of red velvet and vanilla. if only i could be gingerbread. omgosh those cookies are a crack up! pretty sure you stole my dry erase idea...don't worry about it. i'm not bitter. also, you would make that face too if you were staring straight into the face a one eyed monster. cookies and cupcakes look great! love them. and the dry erase for cups I knew you were a genius! Yeah that is unfortunate about the baby-mostly-due/wedding timing...! Ha, too cute. Love all the treats, ESP the undies cookies! Happy Easter lady! I wish we could have heard your and Audrey's commentary throughout the night. Super cute EVERYTHING, as always. I've said it before and I'll say it again...I adore your mom. Will she PLEASE be my KC mom? Uhm hello! 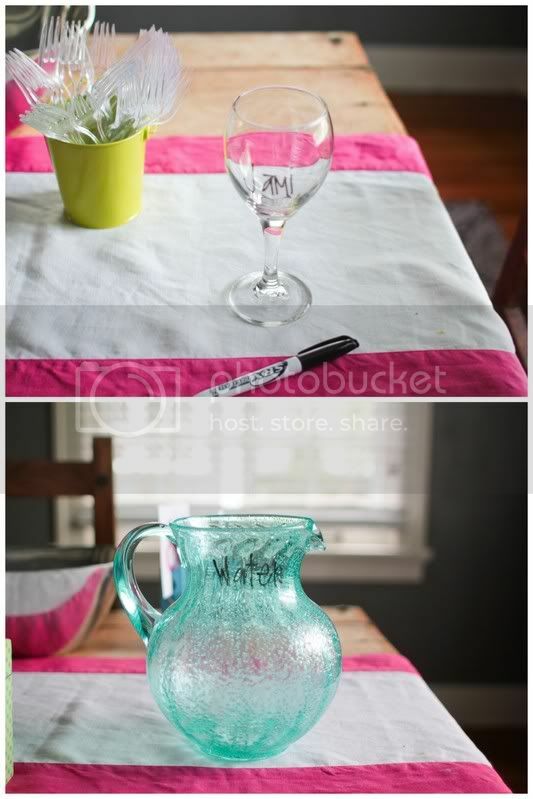 Why didn't I think of the dry erase on wine glass idea?! BRILLIANT! 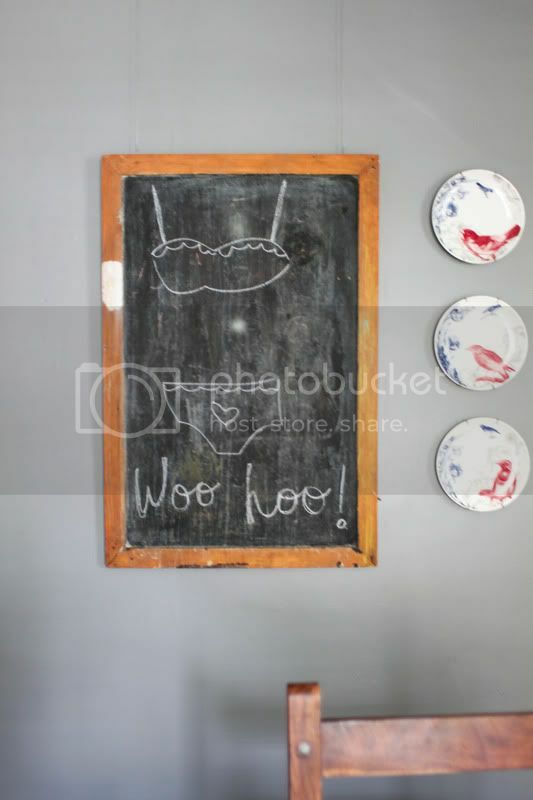 I use to have my students use dry erase markers on everything (obviously not wine glasses) Brilliant friend. And can I just say how cute your bump is? Thanks for letting me rub it at church today. You tell that little girl it's time to come out! super good ideas. 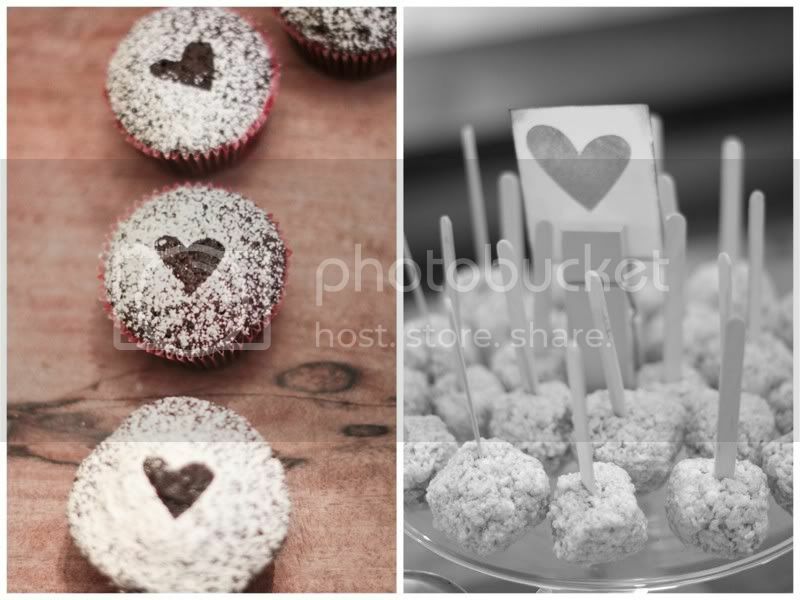 i might try those rice krispie ball things and dip them in chocolate. hmmmm... also the labeling of the wine glasses and stuff is PURE genius. no joke. 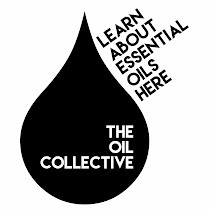 I've been following your blog for a while, and I had to comment on this post.. I helped host a lingerie shower for my boyfriend's sister on Good Friday as well. For some reason, the bride thought it would be a good idea to invite both of her grandmothers. AWKWARD, but also hilarious. I have some great photos of granny trying on bras and holding up nighties. Always a treat to see your party planning details. I guess the "nesting" phase helps with party planning :). Nice facial expressions especially by your sister. And I want to go to your $ Michaels section! Dude this made me laugh! A bridal shower on good Friday. Bahahaha! Oh and I love the Michael dolla section. I never thought to use dry erase markers on glassware! Love that idea! And love the party decor! 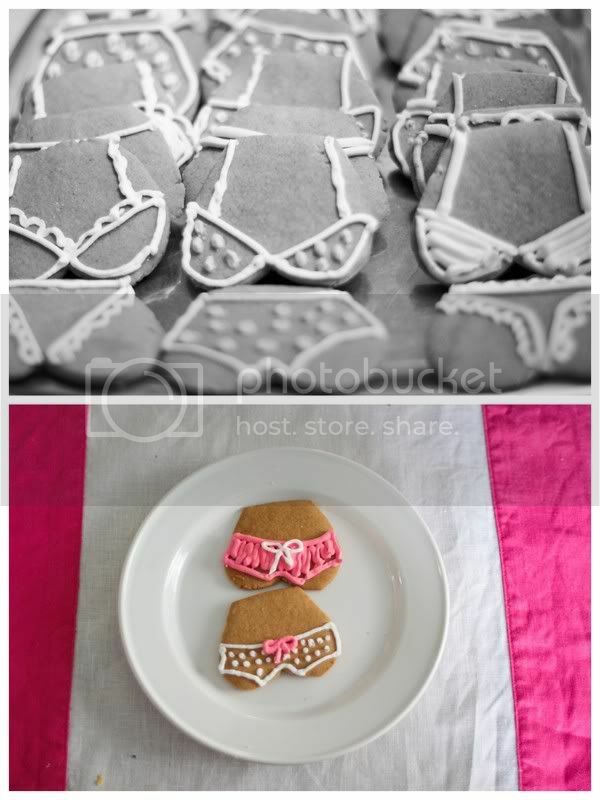 and i am in love with those cookies and i am totally stealing that idea for my bff's lingerie shower!! that whole baby almost falling out thing is scaring me from trying again for a third. honestly. it FREAKS me out. i hold the baby up inside my stomach when i walk the last 2 months. weirdest feeling EVER. This turned out sooooooo cute! You guys did a great job! The "brown" gingerbread cookies? Perfection. :) And the fact that is was Good Friday...no one but you Jami. ;) Btdub, your sister is hilarious - that's exactly what we called "it" growing up, lol! Oh, and is that a "naughty nurses" outfit I see?? Yeah, my friends tried to pull that one on me...my husband's MOTHER is a nurse, yeah not so much! !